A Rough First Week of School for Lewiston’s Dominican Sisters | Parlez-Vous American? In 1903, Father Alexandre-Lousi Mothon, the curé of the Dominican monastery in Lewiston, wrote to the community of Dominican Sisters of Nancy, in France, asking them to send a some of their members to Maine to teach the Franco-American children of Lewiston. Initially, the children of the city’s French Canadian immigrants were educated by lay members of the community. The city itself briefly established a public school headed by a graduate of the state run Madawaska Training School, which trained French speakers to teach Francophone kids. However, in 1878, Rev Hervé had invited the Sisters of Charity of St Hyacinthe, QC, to teach the community’s youth. But the Sisters of Charity were not a teaching order. They were replaced in 1891 by the Dames de Sion. 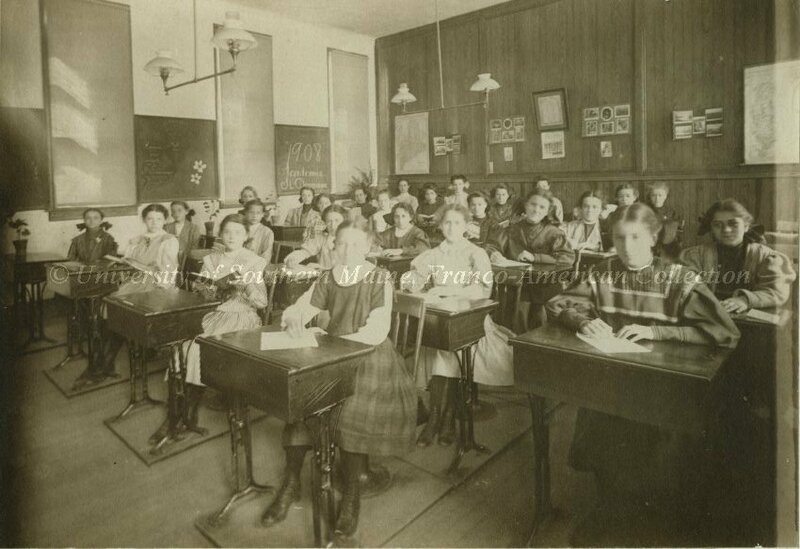 But the Dames de Sion were not supposed to teach boys to according to the rules of their order, and they, too, gave up the task of teaching in Lewiston’s parochial schools, in 1903. Thus Father Mothon turned to the Dominican Sisters of France for help. His request was well-timed. A new government in France had recently taken steps to secularize the French education system, and reduce the status of religious orders in France. The opportunity to teach in Lewiston came just as the sisters found themselves marginalized by the French state. Nonetheless the French nuns were reluctant to take up Father Mothon’s offer. Establishing a new chapter across the Atlantic would be a big undertaking, and the Sisters had no experience as teachers. On the other hand, their situation in France was precarious, and the US st least offered a guarantee of religious freedom they couldn’t find in Europe. After repeated requests from Mothon and others, the Sisters sent a small delegation to Lewiston to learn more. Despite some misgivings, they accepted the assignment, and in the summer of 1904, twenty-eight Sisters came to Lewiston to begin work. Their experiences were recorded in the official history of the new convent, a translation of which is located at the University of Southern Maine’s Franco-American Collection. The First Dominican Sisters in Lewiston, 1905. Image: USM Franco-American Collection. From the start, these women had their work cut out for them. For one, the order struggled to recruit Sisters who could speak English well enough to teach it in the parish schools. In addition to the French nuns, the group included Spanish, Swiss, German, English, and Irish women. They also recruited one bilingual sister who had been born in New Orleans, and arranged the “loan” of four Dominicans from the congregation of St Mary of the Springs in Ohio. Then there was the fact that the French sisters had never taught before. 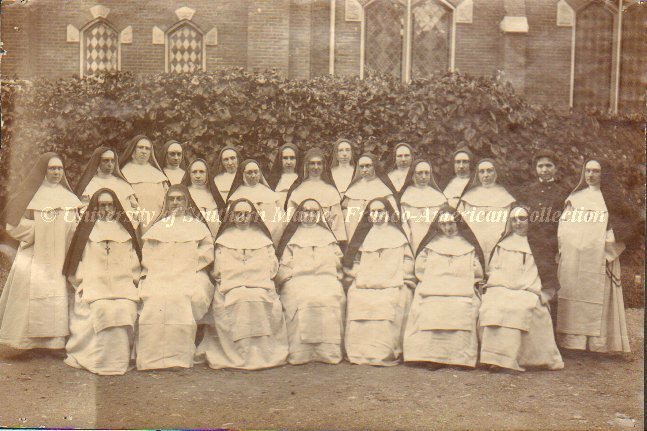 Nine of the sisters came to the United States as an advance group in June, staying in Fall River, Massachusetts, where the Dominican Fathers oversaw another French Canadian parish, and operated three parochial schools. In Fall River the Sisters shadowed the nuns who were teaching there, and learned the basics of the American education system. The rest of the Sisters crossed the Atlantic in July and August, and the entire group made their way to Lewiston by August 24. The Sisters moved into the convent recently vacated by the Dames de Sion, and the new arrivals had to contend with workmen and decorators fixing up the place as they tried to settle in. They also shared the residence with an infestation of fleas. The nuns took this mostly in stride, noting that these were the “true signs of poverty” and that St Theresa of Ávila had also famously been “tormented” by fleas as she reformed the Carmelite Order of nuns in the 16th century. The schools, too, were in a poor state. The nuns spent some of their time “mending and covering books” in preparation for the start of the new term. One last task before the start of the school year provided some relief for the harried Sisters. The Dominican Fathers’ annual summer picnic had been delayed so that the Sisters could join the excursion. The clergy and women religious of the parish took nearly 200 children on a day trip to Casco Castle, the newly-opened “trolley park” in Freeport. The journey by electric trolley took 2 and a half hours but was apparently worth it. The amusement park included a wooden mock castle, a stone tower (which survives today), a zoo and access to the beach. The boys went swimming while the girls (who were not allowed to swim) played games with the sisters. The children had a picnic lunch of fruit, cake and ice cream, toured the zoo, and listened to concert by the parish children’s band, before heading home. “An ideal day,” the Sisters concluded. Casco Castle, Freeport, 1906. Image: Freeport Historical Society/Maine Memory Network. Soon enough though, it was back to the task at hand, and the Sisters were thrust headfirst into their first days of teaching. The hope that the disobedience of the children was just due to summertime high spirits was was soon dispelled. The older boys “didn’t listen to anything…made noise, stood on tables, defying the teacher. One of them said “you won’t hit me?” The Sisters tried to take names and addresses of the troublemakers but many simply refused to give them. Everyone was dismissed after first period. — We haven’t reached that part yet. Children at the “Academie St Dominique,” Bates Street, Lewiston, 1908. Image: USM Franco-American Collection. Gradually, the sisters restored discipline, with the assistance of Father Knapp, and his successor Father Laferrière (who had a telephone installed at the school so they could call on him for help when needed). They implemented a new curriculum, and made tweaks like a merit system for good behavior. A far cry from the raucous scenes of a year before. The Dominican Sisters would continue to run Lewiston’s parish schools for many decades, and as recently as this year, there was still a teaching sister in the school system. The remaining sisters of the order still live at their convent in Sabattus. From rough beginnings, the Sisters came to thrive in Lewiston, leaving their mark on thousands of local Franco-Americans over the years.